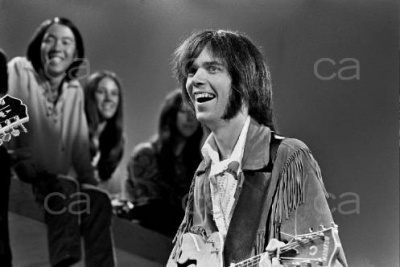 Last year, we received an extraordinary email from Jeff Allen about some rare Neil Young photos from the 1969 1970 ABC-TV show "The Music Scene" where Crosby, Stills, Nash and Young performed "Down by the River". I have over 90 shots in b&w from the taping. I was 19 years old when I was invited to the taping. I can't remember who invited me, but I went with my trusty Nikon F with a 105mm portrait lens. I was so close, I couldn't even get all four band members in the same shot, but got a few with three. I shot the black and whites and also a bunch of Ektachrome slides (which I subsequently lost in the many moves from rental properties over the years) while sitting in the front row of the audience. I was the guy in the long sleeve yellow shirt, second from the left in the opening scene. Check out all the great shots on Cache Agency: Jeff Allen. Coincidentally, I had a conversation over the weekend regarding never seeing a photo of Dylan smiling... never. The black and white photos are fantastic. They capture the true essence of Neil. To have been there to admire such greatness and CSNY in rare good form (it was while watching a show like David Steinberg's that I had the profound first impression that NY was a bloody genius); albeit about 10 minutes less than it rightfully deserves.